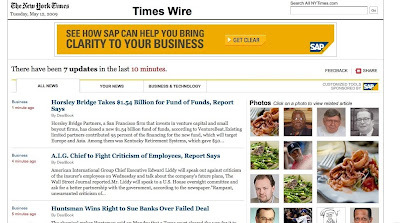 the nytpicker: From The NYT Web Wonks Who Brought You Article Skimmer...Here Comes Times Wire! From The NYT Web Wonks Who Brought You Article Skimmer...Here Comes Times Wire! Here it is, the latest web wrinkle from the NYT, just released moments ago. It's called "Times Wire," and from the looks of it, it's everything the NYT has to offer, in real time -- a mix of AP wire stories and the latest NYT stories from the newspaper, in a nice-looking list. With pictures! We're too tired to look carefully, but we're pretty sure it's amazing.